Chikmagalur district in Karnataka has many peaks appropriate for trekking. The Western Ghats extend to form the Baba BudanGiri range. Mullayanagiri at 1,930 m above sea level is the highest peak in this range and falls in Chikmagalur district. Chikmagalur is famous for its coffee estates. The entire area receives very heavy rainfall, making the trekking routes extremely difficult to traverse in the monsoons. The winters are severe with frequent mists reducing visibility along the treacherous inclines. The best period to go trekking in Chikmagalur is between September and February. Chikmagalur is around 280 km from Bangalore by road. The base for the trek, Sarpadhari, is further 15 km away. The entire trek is around 5 km and should take about 4 hours. Chikmagalur is well connected to Bangalore by road. While traveling in a group, it is advisable to book bus tickets and accommodation in advance. Chikmagalur has hotels providing modest facilities for the traveler on a budget. An overnight journey brings the trekker to Chikmagalur in the early hours of the morning. Buses ply after 8.00 am from Chikmagalur to Sarpadhari. The road runs amidst coffee estates and dense forests for about half an hour. Sarpadhari is a small hamlet from where a well-trodden path takes one to the peak. ‘Sarpadhari’ means serpentine path, and it is indicative of the arduous nature of the trek. The path from Sarpadhari is steep and at times has a 60 degree incline. This trek is definitely not for novices. Mists sweep in without notice in this area, and at times, visibility comes down to less than 10 m.
The hillside is prone to stong gusts of wind, which adds to the chill factor. Warm clothing and woollen caps are an absolute must on this trek. This trek is not advisable for people who have fear of heights. Amenities at the top of the hill are mediocre at best. It is advisable for the trekker to carry adequate bottles of water, beverages, and ready-to-eat food. 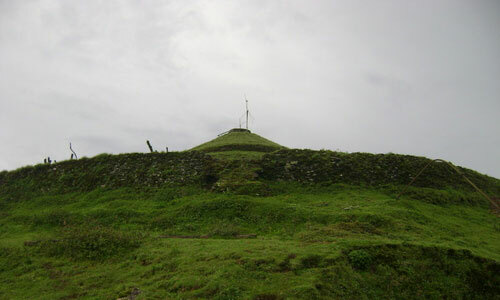 Bababudanagiri is another 12 km on foot from Mullayanagiri. The trek is tiring, and it is advisable to undertake this journey in daylight. The route passes through the Bhadra Forest Reserve and sighting of wild elephants and bears is fairly commonplace. Adventurous souls can pitch camp on the hill side at Mullayanagiri and attempt the trek the next day. Besides its coffee estates , Chikmagalur has the Kodandarama temple, Jamia Mosque, and the new St. Joseph’s Cathedral. Hiremagalur, a nearby village, has an Ishwara temple, a Kali temple, and a Parashurama temple.